As the setting of one of the most famous of Shakespeare’s plays, Verona has a lot of beautiful places to see and experience. There is a lot more here to do than gaze at Juliet’s Balcony and read the messages left by lovers. 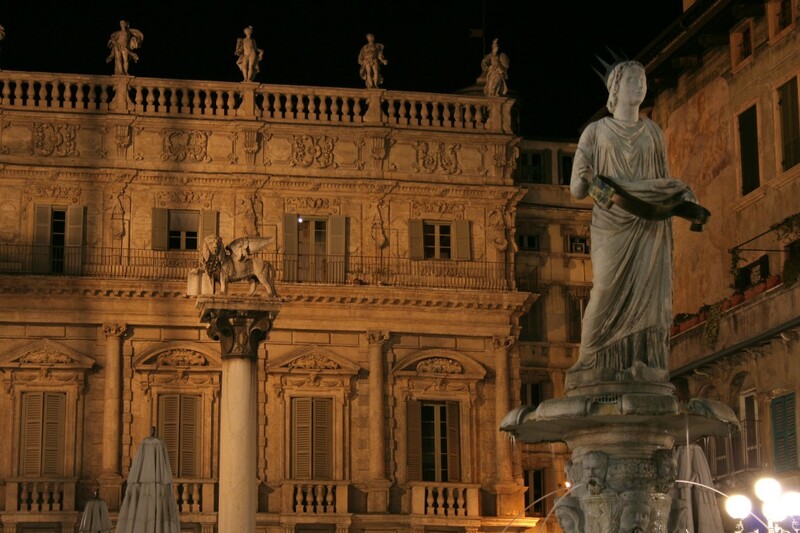 Why not take a look at what Verona has to offer visitors. The famous Arena was built in the 1st century AD for the Romans to enjoy gladiator fights. Today it is in use for concerts and most famously the annual opera festival which has been in operation since 1913. Concerts begin as the sun goes down and the acoustics are magnificent. For a seat to listen to fine operatic performances, book before travelling as most concerts sell out fast. During the day visitors can walk round the 22000 seater Arena and imagine what it must have been like facing lions all those centuries ago. For opera buffs the new Museum of the history of Italian Opera is a fascinating insight into what goes into a performance. Verona is a really compact city and perfect for walking. Its elegant palazzi and narrow streets are beautiful and there is literally history around every corner. Piazza Bra is a good place to start and is home to the arena and lots of restaurants. Via Roma leads to the Castelvecchio and the Ponte Scaligero on the river. Or, have a wander to the Piazza Dei Signorina with its archways, statues, and architecture. For chic window shopping the Via Mazzini is known for its fashion boutiques and stores. Piazza Erbe is right at the centre of the cultural part of Verona and the Torre De Lamberti is a splendid viewpoint across the city. Verona, like many Italian cities, is renowned for food. In this city you’ll find cafes with delicious menu items from pasta to pizza. However, when in Verona the local delicacy is donkey. You’ll find it down as “asino” on the menu and some of the best dishes are a ragu with pasta or donkey salami. The area surrounding Verona is a famous wine growing area. If you have a chance, go visit the vineyards where Valpolicello is produced. Alternatively, enjoy a glass with a meal in town. Verona has some beautiful gardens which are ideal to escape the noise and crowds in the city centre. The Giardino Giusti is a delightful renaissance style garden with lower lawns and paths climbing into the hillside giving views over the city. There is a maze too for visitors who like a puzzle. Take a picnic to enjoy on one of the seats in this lovely green space in Verona. If you plan to spend more than a day in Verona then get a Verona Card from the Tourist Office. This gives free access to many of the museums and attractions in town, enabling visitors to save some money. It includes entrance to the Arena, Castelvecchio, and Juliet’s House amongst several other places. In Verona the best art museum to go to is the Castelvecchio. This imposing castle was converted to a museum and is one of the finest collections of renaissance art in Italy. There are paintings by Tintoretto, Pisanello and more here. The Fresco Museum is another treasure that holds a collection of painted frescoes from Italian churches. It is en route to Juliet’s Tomb and often overlooked. For some unusual art try the Museo Lapidario Maffeiano which displays stones retrieved from Roman tombs as well as stonework from the Etruscans and Greeks. For a day trip, Lake Garda is a short drive from Verona and a beautiful place to spend a few hours. This is the perfect antidote to the summer heat and relaxing on a boat trip or in a café in Bardolino is a superb way to chill out. Venice with its famous canals is another option for a day visit from Verona. Verona has so much to see and do and it is possible to wander around without seeing much of the Romeo and Juliet connections. You’ll find the famous balcony but there are also the Scaligeri Tombs and Juliet’s House which in reality is a renaissance building. It is a romantic city but also renowned for its music and architecture. Start planning that visit to Verona today. Mouth on Fire? Take a Swig of This!